WASHINGTON (AP) — President Donald Trump says John McCain failed his fellow veterans, stained public policy and took anti-Trump fake news to the FBI before the 2016 election. McCain can’t respond but his record speaks. Trump misrepresented it, on matters stretching from McCain’s school days to his funeral, as he went on a tear about the late Arizona senator, Republican presidential candidate, Vietnam War naval aviator and tortured prisoner of war. TRUMP: “I gave him the kind of funeral that he wanted. ...I didn’t get ‘thank you.’ That’s OK. We sent him on the way. ” — remarks Wednesday at the Army tank factory in Lima, Ohio. THE FACTS: Trump did not “give” a funeral for McCain. He did sign off on the military transport of McCain’s body. But the venues and arrangements were the responsibility of others. And thanks were conveyed. At the time, McCain family spokesman Rick Davis cited “the Trump administration, the White House,” the defense secretary and department, and the Military District of Washington for their combined effort on logistics. “We really thank them for coming together very quickly and pulling together all of the federal resources,” he said. McCain’s family made clear that Trump was not welcome during the weeklong, cross-country ceremonies that the senator had planned himself. Instead, McCain invited former Presidents George W. Bush, who defeated McCain during the 2000 GOP nomination fight, and Barack Obama, the Democrat who defeated him in 2008, to deliver eulogies on the value of pursuing goals greater than oneself. Trump went golfing and was uncharacteristically quiet on Twitter during the Washington events. THE FACTS: This is false. Trump has been assailing McCain without any prompting by the media. He tweeted a week ago about “last in his class” McCain (who wasn’t last in his class), after a tweet about “stains” on the late senator’s record. And after extended opening remarks in the speech at the Army tank factory on Wednesday, Trump abruptly segued by telling his audience: “A lot of people are asking, because they love me, and they ask me about a man named John McCain.” He went on to devote nearly 800 words to criticisms of McCain. TRUMP: “McCain didn’t get the job done for our great vets. ... The vets were on my side because I got the job done. I got Choice and I got accountability.” — remarks at tank factory. TRUMP: “Well, you better love me; I kept this place open, that I can tell you.” — opening line in speech at tank factory. Trump did not mention the formal name of the act he signed that increases the military budget. It’s called the John S. McCain National Authorization Act in honor of the senator’s efforts to support military capability as well as higher pay for troops, which the law provides. TRUMP: “John McCain received a fake and phony dossier. Did you hear about the dossier? It was paid for by Crooked Hillary Clinton. Right? And John McCain got it. He got it. And what did he do? He didn’t call me. He turned it over to the FBI, hoping to put me in jeopardy.” — remarks at tank factory. TRUMP: “So it was indeed (just proven in court papers) ‘last in his class’ (Annapolis) John McCain that sent the Fake Dossier to the FBI and Media hoping to have it printed BEFORE the Election. He & the Dems, working together, failed (as usual).” — tweet March 17. THE FACTS: Trump’s chronology is incorrect. McCain did not present then-FBI Director James Comey with a copy of the memos compiled by former British spy Christopher Steele until December 2016, after the election, according to a deposition from a McCain associate, David Kramer. FBI officials had access to Steele’s research on Trump before the election, as they referred to it as part of an application for a secret search warrant of Trump associate Carter Page. Trump often claims falsely that special counsel Robert Mueller’s Russia probe was based on the dossier. That probe examined Russian interference in the 2016 U.S. presidential election and possible coordination with the Trump campaign. The FBI’s investigation actually began months before it received the dossier of anti-Trump research financed by the Democratic Party and Clinton’s campaign. The FBI probe’s origins were based on other evidence — not the existence of the dossier. TRUMP: “We’ve created more than almost 6 million jobs since the election. And if I would have said that to the fake news during the campaign they would have said, ‘He exaggerates.’ ... Including almost 600,000 manufacturing jobs.” — remarks at tank factory. THE FACTS: He’s not exaggerating on job creation. But that record is not all his, and it’s not remarkable. By counting since the election, he’s taking credit for jobs created in the last months of the Obama administration. The country has added 466,000 manufacturing jobs, not “almost 600,000,” since Trump took office. TRUMP: “Everyone said, ‘You couldn’t do it, couldn’t bring back manufacturing jobs.’ ... We’re bringing them back beyond anybody’s expectations.” — remarks at tank factory. THE FACTS: It’s hard to show that manufacturing has been “brought back.” There are now 12.8 million jobs in U.S. factories, below the 13.7 million just before the recession started and far below the roughly 17.2 million in 2000, just before China joined the World Trade Organization and gained greater access to the U.S. market. TRUMP: “And we just came out — another chart — we just came out with numbers — the Economic Report of the President: 3.1 percent GDP. The first time in 14 years that we cracked 3, right? That’s pretty good — 3.1. The press tried to make it 2.9. I said, ‘It’s not 2.9.’ What they did is they took odd months.” — remarks at tank factory. It comes from a traditional measure of gross domestic product, comparing growth in the size of one year’s economy with the previous year’s. That measure shows 2.9 percent growth. But there’s another way to measure, which Trump goes by because it looks better. He is citing a comparison in the size of the economy in the fourth quarter of 2018 and the fourth quarter of 2017. That shows 3.1 percent growth. Some economists consider this measure to be a legitimate way to look at growth, if not the usual way. But when comparing quarters from one year to the next, Trump is wrong to say that growth hasn’t cracked 3 percent in 14 years. In 2015, the second quarter was up 3.8 percent from the year before. TRUMP on the World Trade Organization: “We’re doing even better with WTO. We’re winning cases all of the sudden, because we never won cases, now we’re starting to win cases because they know my attitude. If they don’t treat us fairly we get out.” — Fox Business Network interview broadcast Friday. THE FACTS: It’s not true that the U.S. always lost trade cases adjudicated by the World Trade Organization before Trump. The U.S. Trade Representative Office announced in September 2016 a “decisive” WTO victory in a case that the U.S. said had cut its solar exports to India by 90 percent because of that country’s domestic content rules. TRUMP, on Mueller’s report on his Russia investigation: “I want to see the report. And you know who will want to see it? The tens of millions of people that love the fact that we have the greatest economy we’ve ever had.” — remarks Wednesday to reporters at the White House, before Mueller sent the report to Attorney General William Barr on Friday. Independent economists widely expect slower growth this year as the effects of the Trump administration’s tax cuts fade, trade tensions and slower global growth hold back exports, and higher interest rates make it more expensive to borrow to buy cars and homes. TRUMP on the formation of the special counsel investigation: “Again I say, a deputy, because of the fact that the attorney general didn’t have the courage to do it himself, a deputy that’s appointed appoints another man to write a report.” — remarks Wednesday to reporters at the White House. THE FACTS: The attorney general at the time, Jeff Sessions didn’t lack courage in the matter; he lacked standing. He recused himself from anything to do with the Trump campaign’s interactions with Russia because his work for the campaign placed him in a potential conflict of interest. It then fell to Deputy Attorney General Rod Rosenstein to decide whether to appoint a special counsel, and he did. Mueller sent his report to the attorney general on Friday. TRUMP on Mueller: “I know that he’s conflicted and I know that his best friend is Comey, who’s a bad cop.” — remarks Wednesday at the White House. 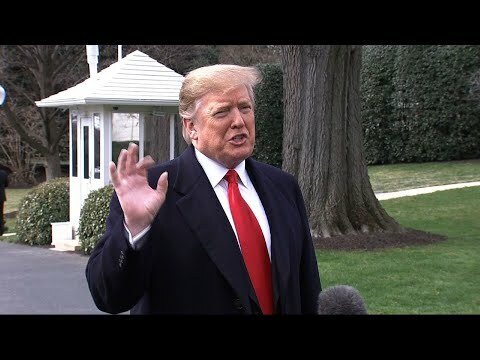 TRUMP, on the Mueller report: “It’s sort of interesting that a man out of the blue just writes a report.” — remarks Wednesday. THE FACTS: Mueller didn’t wake up one day “out of the blue” and decide he wanted to write a report. It’s mandated under the regulation that spells out the grounds for his appointment and duties as special counsel. TRUMP: “Instead of waiting in line for two days, two weeks, two months, people waiting on line — they’re not very sick, by the time they see a doctor, they are terminally ill — we give them Choice. If you have to wait for any extended period of time, you go outside, you go to a local doctor, we pay the bill, you get yourself better, go home to your family — and we got it passed. We got it done.” — remarks at tank factory. TRUMP: “I got 306 electoral votes against 223. That’s a tremendous victory. I got 63 million more — I got 63 million votes.” — remarks Wednesday at the White House. Trump did indeed win nearly 63 million votes in the 2016 election, but it was fewer than the 65 million for Clinton, who won the popular vote after racking up lopsided victories in big states such as New York and California, according to election data compiled by The Associated Press. Clinton, however, lost the presidency due to Trump’s winning margin in the Electoral College, which came after he narrowly won less populous Midwestern states, including Michigan and Wisconsin.